The charge of “Russophobia” is hurled around with some abandon, and I have been the target of such accusations on more than one occasion, especially in the hothouse environment of the ongoing Russo-Georgian War. More often than not, this word is used as an ad hominem substitute for reasoned argument, and as such is intellectually lazy and intellectually dishonest, and hence not deserving of a reasoned rejoinder. Inasmuch as I have been a harsh critic of the Russian government, however, it is legitimate to question the basis for that criticism, and to try to understand the basis for the emotional responses that it engenders. The divide is a fundamental and philosophical one. My criticism is deeply rooted in classical liberal beliefs that put the highest value on human freedom, and which emphasize the essential importance of the rule of law, equality before the law, free markets and contract, and limited government as the essential means for guaranteeing liberty. These beliefs imply a particular relationship between citizen and state. I can say it no better than Milton Friedman, in the first paragraphs of Capitalism and Freedom. This credo contrasts starkly with the political philosophy that has dominated Russian thought from the rise of the patrimonial state to the very present. Throughout Russian history, the individual residing in the territory ruled by Tsar, Commissar, or latterly, President has been more subject than citizen. The government did not serve the individual, the individual served the government. It was not a government of the people, by the people, and for the people; it was a people of the state, ruled by the state, to be used for the state’s ends. The role of the state was not to serve the people; it was the role of the people to serve the state. The rule of law has seldom, if ever, existed in Russia. Citizens have never been equal before the law, and the sovereign almost never subject to it. Theoretically and practically, the government has almost always been unlimited (except for brief intervals 1905-1917, and perhaps 1991-1999.) The rights of property contract have almost always been highly abridged, and always at risk to the predations of the state. Until the mid-18th century, Russia was formally a patrimonial state in which everything was property of the sovereign, and under which everyone owed the state service. In subsequent years, service obligations were diluted and some formal property rights established, but even these were at risk to arbitrary expropriation that was limited more by political prudence than constitutional constraints. And, in the Soviet era, even these modest gains vanished. Indeed, Russian thinkers and rulers have been harsh critics of liberalism, and proud advocates of an anti-liberal order (as Richard Pipes details in his Russian Conservatism and Its Critics). Post-1815, Russia was a leader of reactionary, anti-liberal forces in Europe. Putin and his coterie are consciously heirs to this intellectual and political tradition. They have a decidedly state-centric view. They are dedicated to enhancing the power of the central state. They disdain the rule of law (which is evidenced more by deed than word), and under their rule private rights of property and contract are completely conditional on the acquiescence of the state. Those that support Putin are cheerleaders for the state at the expense of the freedom of its citizens. It is this fundamental philosophical and moral divide between the classical liberal views I espouse, and the anti-liberal views of the Putinists, that explains my intense antipathy for the current Russian government and state, and which is the wellspring of my trenchant criticism. It is not a divide that can be bridged, as these are antithetical conceptions of the roles of the individual and the state. Russia has long been among the most powerful (both physically and rhetorically) advocates of the anti-liberal cause. After a brief dalliance with liberalism at the false sunset of history in the 1990s, it has resumed this historical role. Historically, Russia has also been an imperialist power, with its imperial ambitions fueled by a combination of pecuniary and civilizational (at times bordering on the messianic) motives. These traditions are too in the ascendant, as evidenced both by increased bellicosity and the terrified responses of those nations who were once in the Russian thrall. In sum, there is a civilizational chasm that divides me, and many other contemporary critics of Russia, from our opponents. Does that make us “Russophobes”? The issue is largely a semantic one. To the extent that those that hurl the term insinuate an unthinking hatred for Russians as individuals–the answer is defiantly no. Even less is it (as one commentator absurdly asserted) “racism.” But to the extent that many Russians are proud intellectual heirs to their nation’s traditional modes of political thought, discourse, and action, well, yes–I do oppose you; I dread (for Russians most of all) the implications of your obtaining ascendancy within Russia; and believe it is the duty of people and governments everywhere to resist your efforts to extend Russia’s power beyond its borders. Honest Russophiles should admit–indeed embrace–the civilizational dimensions of the dispute. Latter-day Slavophiles and Eurasianists are proudly anti-liberal; they conceive of Russia as a distinct civilization with a unique historical mission defined in opposition to Western, and especially Western Liberal, beliefs. I understand their antipathy to the West. I understand why they dislike me and what I have to say. So, call me a Russophobe if you will. But don’t expect that such epithets will dissuade me from opposing, in my small way, a government, a state, a political system, and a worldview that is inimical to mine, any more than I expect that my words will have the slightest impact on a devoted Russian nationalist (except to arouse his ire or contempt). We come from different worlds–different civilizations, really–and neither is about to convince the other. Instead, I conceive my role to be to communicate to those who more or less share my philosophical beliefs that the current Russian government is an enemy of those beliefs. Moreover, as I believe that that state is the enemy of the freedom of individuals of Russian heritage and culture, and thwarts the ability of those individuals to realize their human potential, in my opposition to that state I truly conceive of myself as a Russophile. Believe it or not. In reply, Timothy Post made a connection between religious absolutism (which afflicts a worryng high percentage of the American population) and the Manichaean view of the world as being divided into “axes” of good and evil, etc, typically with America being the shining city on the hill and Russia being invariably shunted off to the “bad guys” team (further, there’s also the messianic component, which has been transferred from spreading Christianity to spreading democracy, whether the aboriginals like it or not). I believe conventional Russophobia is just another variant of Orientalism (as defined by Said) relying on one-dimensional caricatures of Russian cultural reality as one of millenial despotism, contempt for the individual, etc. This ignores the many instances of democratic/liberal tendencies organically appearing in Russian history, from the Veche of medieval Novgorod to Putin’s consolidation of liberal democracy in the last 8 years (I view Yeltsin’s period as closer in spirit to the Time of Troubles). I also question your thesis of a “civilizational chasm” between Russia and the West. It ignores the fact that there have been numerous despotisms throughout Western history and some general trends, e.g. the high status of the state in economic planning that one sees throughout French history from Colbert to Mitterand. Finally, I find talk of chasms and divides that cannot be bridged both pessimistic and in a way self-fulfilling. 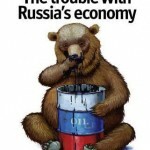 I have long observed the sheer disconnect between Russian reality and Russian reality as presented in Western texts. This has led me to conclude that either Western observers really are all incompetent / myopic (i.e. slaves of their own misrepresentations, accumulated over centuries) or actively malevolent / eager to fight an info-war. Yet another intepretation I’ve had fun with in the past is the fundamental human need for enemies, opposites, etc, in order to define themselves. This is becoming harder and harded in today’s world, what with liberalism, secularism, etc, and thus the people need an outlet into fantasy. Hence Russia = Mordor. Such desires to see evil in others reaches its logical conclusion in the form of religious fanatics and other assorted loonies going on about the Final Phase of Communist Russia’s plans to extend its dominion over the entire world. If you have your own idea on how to go about deconstructing Russophobia (and Russophilia), please comment.